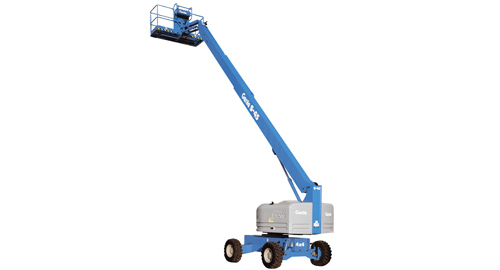 Looking to rent a Genie Boom Lift? 46 Foot Straight Mast Boom Rental – Genie S-40, is available for rent in Rochester NY, Ithaca NY and the entire Western New York region from the Duke Company. The Genie S-40 capability includes 360 degree continuous rotation capability and rotating, self-leveling platform with hydraulic platform rotation. Turntable Rotation = 360 degrees continuous. Turntable tail swing = 2 feet, 10 inches. Gradeability – 2 wheel drive – stowed = 30%. Greadeability – 4 wheel drive – stowed = 40%. Turning radius – outside = 15 feet, 8 inches. Weight (standard) = 12,320 pounds.